It’s time . . . for the table saw-bandsaw matchup for building a table. Most of this applies to other post-and-rail or leg-and-apron construction such as cabinets-on-stand, beds, benches, and frame-and-panel casework. I’m afraid this is going to be a brutal mismatch, but don’t worry, the referee is nearby. The bandsaw has decisive advantages over the table saw for making the legs. First, it allows for the artful selection of long-grain figure unrestricted by its original orientation to the edge of the board. Of course, the ability of the bandsaw to cut curves allows infinite options beyond simple straight tapers. However, straight cuts in the thick stock usually used for legs are also more comfortably done with the bandsaw, used in conjunction with a jointer (hand or machine). Ripping 10/4 bubinga with even a 3HP cabinet saw is not fun. Now just in case the faint of heart are wincing at this lopsided bout, I point out again that it is best to have a bandsaw and a table saw. 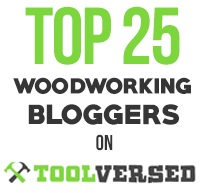 As discussed in the previous posts, this match-up is really about the priorities that guide one’s approach to woodworking. Moving on to the aprons and top, figure selection and options for resawing are again important. You might consider a bookmatched solid wood top for small tables. Curves in the rail members are also more likely to come from bandsaw thinking. Interesting designs can be created with thick veneer which can readily be produced with the bandsaw. 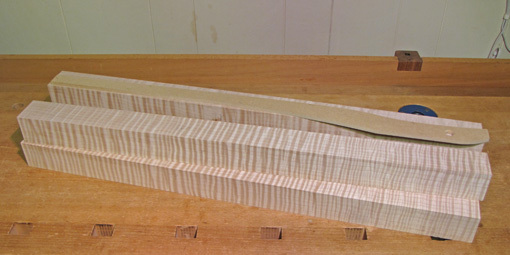 The photo below shows 11″ wide ribbon-stripe khaya directly from my bandsaw. The pieces to the left will finish to 3/16″ thick after minimal planing, suitable for false drawer fronts, and the pieces to the right will finish to 3/32″, suitable for thick veneer. For mortise and tenon joinery, the heart of leg and apron construction, both the table saw and the bandsaw can make good tenon cheeks, though the table saw can also easily cut clean shoulders. Otherwise, there are few straight, clean, critical crosscuts required in building most tables, thus neutralizing one of the table saw’s strengths. Don’t forget that in the design stage, as you unleash your creativity, the bandsaw makes mock-ups wonderfully fast and fun. Some woodworkers may be concerned that the bandsaw takes more setup, learning, and tuning. I do not think it is harder to set up a new bandsaw than a new table saw. Learning the bandsaw is mostly fun, with less intimidation than posed by the table saw. Further, there are many excellent sources of information, including books by Mark Duginske, Lonnie Bird, and Roland Johnson. I admit, however, that changing and cleaning bandsaw blades are among the least pleasant jobs in the shop. I suggest get a steel frame bandsaw with at least 12″ of resaw height with motor power to match. Fortunately, bandsaws do not take up much space. Minimax and Agazanni are among the makers of excellent machines, and Grizzly and Rikon make very good, less expensive ones. If you have any money left over, consider buying a table saw; I hear they’re quite handy. Here – we – GO! Let’s look at building a wall cabinet with two frame-and-panel doors. The style can be Krenovian, Arts and Crafts, Shaker, whatever you like. The same principles can be applied to other casework such as boxes and chests. I will make the somewhat artificial distinction between a table saw-centric and a bandsaw-centric craftsman. As discussed in the previous post, this is not a question of using one machine to the exclusion of the other, rather it is about which tool tends to guide your approach. Furthermore, this does not imply that one machine defines a craftsman’s entire methodology; obviously there are other tools in the shop. Wood is selected, and the project starts with the case top, bottom, and sides. The table saw woodworker is likely to accept one of the sawmill’s edges of each board as starting points. After flattening a face and thicknessing, that edge is jointed and the opposite edge is ripped parallel. The bandsaw guy is likely to start with more design freedom and not assume that the case will have straight edges, but even for a customary case with rectangular components, he has more opportunity to sensitively make the most of the wood. One of the most common pitfalls early in a project is automatically accepting the board’s edges that were sawn at the mill. The bandsaw guy studies the board and extracts the best parts, unfettered by the original orientation of the figure. Resawing, the bandsaw’s forte, gives the freedom to seek out and use excellent wood in any thickness. For example, matched sides could be created from a figured billet. Well fans, it looks like the bandsaw is doing moves the table saw has never seen. Ouch. Wait, you say, isn’t it more accurate to rip the opposite edge parallel on the table saw? Yes, and if the table saw is available, use it. However, the advantage is small, especially with a well-tuned bandsaw. Furthermore, in both cases, the most accurate and well-surfaced final rendition of fitted edges will come from a handplane. What about crosscutting? Again, the table saw has an advantage but it is only a little more trouble, and it is more controlled, to shoot the ends by hand which can be done after they come off the bandsaw. The bandsaw is an MMA fighter and the table saw is a classic boxer. Let’s consider making the doors. This is where the fight goes to the ground. With the bandsaw you can easily resaw a beautiful boardto make bookmatched panels that will be the best feature of the piece. Yes, you can resaw with the table saw but it is awkward and limited. Resawing is a gateway technique that can change how you think about wood. Ha, you say, making the door rails and stiles has got to be where the table saw has the advantage. Yes and no. Once again, the all-important management of the wood is best done on the bandsaw. The figure in the wood used for the frame should be harmonious. Some craftsmen even like to resaw and bookmatch these pieces. The inside edges of the frame members will come off the jointer (hand or machine), and it is handy to then rip them on the table saw. However, for fine work, the width of these pieces will be cut a bit oversize and the final fitting of the doors to the case is best produced with a hand plane. A bandsawn edge is an adequate starting point for that. Creative, interesting handles for the doors are more likely to come from a shop with a bandsaw. And so the table saw taps out. The main points are that the bandsaw facilitates more creativity in design, and far more artful use of wood. Though the table saw does have advantages in ripping and crosscutting accuracy, these are easily circumvented by using the bandsaw in conjunction with hand tools in an incremental, controlled approach to fitting the parts of a project. In short, a bandsaw-centric approach can produce better craftsmanship. Next: The Rematch. Let’s look at how this applies to making a table. Now this could get ugly. 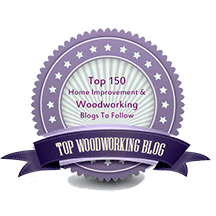 I have had many conversations over the years with woodworkers who were building or upgrading their shops and facing the question of where to place the higher priority, on the table saw or the bandsaw. Sure, with enough money and shop space, as well as time to set up, learn, and fuss with these tools, the most versatility is gained by having both machines. However, since we all deal with practical limitations, and shops are usually built incrementally, it is worthwhile to compare their merits. You might be able to buy only one of these two machines, or there might be a long wait before buying the second. If you are buying both, you might be wondering which one warrants a bigger share of your money. More fundamentally, we tend to think through the building process, and even the design options, with our tools in mind. We steer our work toward the tools with which we are most comfortable – our “go-to” tools and skills. So this discussion is more significantly about which of these two machines do you mentally reach for first. The table saw excels at accurate ripping parallel to an existing straight edge. It can also very accurately crosscut at a chosen angle, usually 90º, to a straightedge. 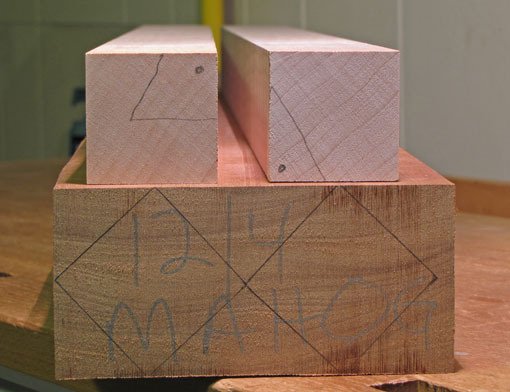 Some joinery can be accomplished, such at making tenons, slip joints, and dovetail work. Grooves and dadoes can be cut with the addition of a dado set. The bandsaw can also rip and crosscut, but the sawn surface is generally not as exquisitely accurate nor as clean as that produced by the table saw. Truing and smoothing, sometimes tedious, are required. Using the bandsaw may seem like more work and even feel crude compared to the table saw. I suspect this imagery is what causes some woodworkers to view the bandsaw as the second-banana sawing machine in the shop. They may figure that it is nice to have for cutting curves, but since they mostly make Arts and Crafts and Shaker style furniture, it gets dropped down on the priority list. As you might guess, I strongly disagree with this “table saw-centric” view. Further, to those woodworkers who are making a priority decision as discussed above, I contend that placing the bandsaw first will, in most cases, make you a better craftsman. Too often with issues like this, there is the tendency to think of the tool’s functions in isolation. It is more useful to think through the design and building processes, and how the tool can change what you can accomplish. So instead of listing what each machine can do, salesman-style, let’s look at real project scenarios using these machines. 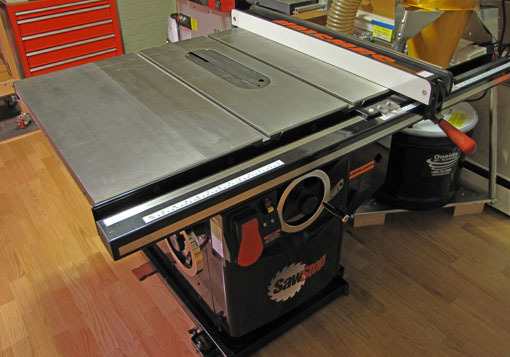 For the record, I own and happily use a Saw Stop 10″ cabinet saw and a Minimax 16″ bandsaw. This is not a question of one machine to the exclusion of the other but a matter of prioritizing which machine tends to guide your woodworking. Next: Round 2, the real action starts. We’ll consider these projects: a wall cabinet with frame and panel doors, and a table with straight-tapered or curved legs.